Free printable sewing patterns to make new outfits yourself for your fashion dolls. Patterns are in pdf files for easy printing. THANK YOU to everyone who has sent pictures of the finished product! I love seeing all the different interpretations! Hi Janel, I have to tell you I LOVE the strapless bodice and especially the halter top. They have become my new best friends! I found the halter top so useful! It has become a bathing suit top, a sundress, pajama top and more. I cut 4 pcs and sew them together – I found it was easier for me to turn them inside out than try to make tiny rolled hems. Thanks for your great creative ideas and patterns! Keep up the great designs! It is really tough to find nice ones like yours. Most of the ones I’ve seen on the internet look very amateurish, and commercial patterns cost so much any more! I wanted to let you know that I have used your bodice pattern to make my granddaughter several barbie doll dresses and have found that pattern to be so easy to use, so versatile and wanted to thank you for taking the time to make it and share it. I've attached a pic. Your pattern is designed so well that any dress I've made with it ends up looking very professional - I love that! Hi! 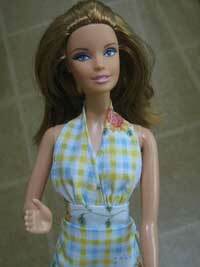 Just dropping a note from far far away Brazil to tell you that I used your Barbie pattern and it worked very well! This was my second try with a doll clothing, I have no experience with adults clothing either, but, with your easy instructions, I could do a very good work (IMHO). Please see attached. At first, I thought it wouldn't work, because there are 6 different Barbie bodies - this is a very cheap Barbie - but it worked so well! ... thanks so much for the free pattern. I have tried to find basic Barbie patterns on line and I cant find anything quality but your site. 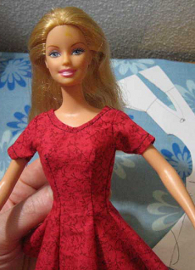 A few weeks ago I was searching around the 'web to find a simple pattern for a Barbie dress, and I came across your website! Needless to say I printed one of the dress patterns that was provided and made a dress that I'm quite proud of! I saw those Mannequin jewelry holders at Hallmark, and instead of paying an outrageous price for them, I decided that with an old Barbie of mine who's head fell off and can't be replaced, I could sew a dress (out of scraps that were cut off of my own grad dress) for this doll. While I haven't gotten around to making a base for her yet, or added the part that will hold all the necklaces and such, I have just finished the dress portion! I just wanted to send along the pictures of the dress I made, and thank you for such a help your website has been! It really encouraged me to tackle this project! Unfortunately, the back didn't match up too well, but I am fairly happy with it, as I am not an experienced seamstress in the least!! Thank you so much for the Barbie dress pattern. I tried it out yesterday and it fit modern Barbie like a dream. It went together great. My little girl wanted it to be a prom dress, so I cut the skirt 12” x 7 ¾”. She was very pleased. This is just the pattern I have been looking for, simple enough for a novice like me. Thanks again! 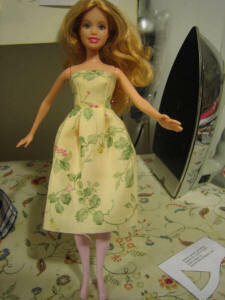 Hi - just to let you know that I used your pattern for the Barbie dress for my gal this morning. The darts were perfect!! The pattern printed the right size straight away, and as you can see from the pics it fits a dream. Thanks for sharing the pattern. I just wanted to thank you for the bodice pattern for the Barbie doll clothes. I made my first dress for my 6 yr old and she loved it!! And I am NOT a sewer. In fact it turned out so well the little girl next door wants me to make her one. It was so fun to do I hers is almost done! Thanks again! I tried your pattern for the doll dress! It was incredibly easy and fits barbie perfectly! The pattern printed in the correct size which was awesome! I made my daughter 4 dresses! She absolutely loves them! I think I love them more than she does...although she is 4. lol Thankyou for sharing! Hi, Janel! I just wanted to tell you "Thank You!" for sharing your Barbie, Brenda, and Gene patterns. They are just great! 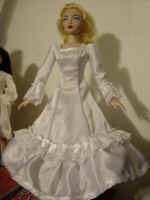 I just purchased a Sydney doll, and she came in only a swimsuit, so I am looking forward to making her a pretty dress. Thank you again so much! 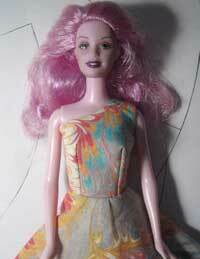 Thanks so much for your bodice Barbie pattern. It is the right size to print. Made dress last night, bodice is perfect. Skirt is made with about 1” ½ less material. Red marks on bodice are guides for darts. Had a little trouble with gather of skirt, but all up very impressed with first try. 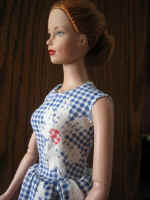 Thank you for the pictures and pattern on how to make an easy doll dress. My daughter is turning 6 this weekend and is having a party where she wants to "craft sew" for the activity. She has been bugging me to teach her to sew, and especially to make doll clothing, so I'm going to give it a try. While preparing a "lesson plan" on how best to teach this without getting a group of six-year olds overwhelmed, I created this 8 x10 printout tutorial, all from your website. I made it into a 7-step process and they will be sewing by hand (yikes!). I plan to pre-cut pattern pieces and may do the finishes (velcro closure) for them and let them eat cake....we'll see. Since it is for my own personal use, I didn't cite your website, except for the email within your pattern. But I thought you would like it anyway and post it for others to print out and have a one-page reference including your pattern? Either way, thanks for the pattern and instructions! I made your Barbie strapless top and dress pattern, and was very happy with the results! It printed out quick and easy, didn't even have to mess with paper margins, and I had it together and on the doll in minutes. I have VERY minimal sewing skills, but I had no problem following your directions at all. I found your pictures very helpful, especially the one that showed how to pin the top and skirt together, as I was cluless as to how to do that correctly. Here is the picture of my end result. The only problem I had was with the darts, my machine kept wanting to chew on the fabric, so I ended up hand sewing those and was not thrilled with the way they turned out. I'm looking forward to trying more of your patterns! Thank you for putting out there! I made about 5 dresses last night. velcro to secure it in the back. Thank you so much for the barbie pattern. It fits perfectly. I'm sending you a couple of photos. The skirt is rather short because the piece of fabric was narrow. Just a quick note to say thank you so much for the Barbie patterns. My daughter is mad about the Disney Princesses and dressing up, so using your patterns I have made her a Belle, an Aurora and a Cinderella dress for her Barbie doll, so she can join in with the dressing up too! She’ll get them for her birthday this coming weekend, and I think they’ll make her day. So thanks for putting up the patterns and instructions – I wouldn’t have been able to make them without your help.